Easy Candy recipes to add to your ‘Cooking with Kids’ file- yummy for adults too! 2. Remove bowl from microwave and stir to mix ingredients. 3. Add vanilla and nuts and stir until blended. 4. Pour in greased container and place in freezer for 20 minutes or refrigerator for 1 hour. 5. Cut and serve. Yield: 60 pieces. 2. Put in a 8″x8″ inch microwave safe pan (important to use this size pan). 3. Add milk and vanilla extract. 4. Place chunk of butter/margarine in center ( leave butter as whole do not chop up). Microwave on high for 2 minutes until bottom of dish feels warm. Stir vigorously and blend in chopped nuts. 5. Put in mold or whatever and chill for 1 hour. *Use real butter for best results. Put chocolate chips and sweetened-condensed milk in microwave safe bowl. Cook on high for 5 minutes. Remove from microwave, stir in peanut butter. Melt chocolate chips and peanut butter over medium heat (or in microwave watching closely). Fold in marshmallows and raisins, stirring until marshmallows are melted. Pour into 7×11 pan and chill until firm. Cut into squares. Store in an airtight container in the refrigerator. 1. LINE 13 x 9-inch baking pan with foil; grease lightly. 2. MICROWAVE morsels and sweetened condensed milk in large, uncovered, microwave-safe bowl on HIGH (100%) power for 1 minute; STIR. 3. Morsels may retain some of their original shape. If necessary, microwave at additional 10-to 15-second intervals, stirring just until morsels are melted. 4. Stir in vanilla extract. Fold in marshmallows and nuts. 5. PRESS mixture into prepared baking pan. Refrigerate until ready to serve. 6. Lift from pan; remove foil. Cut into pieces. 1. Microwave butter and peanut butter for 2 minutes on high. 2. Stir and then microwave on high for 2 more minutes. Add vanilla and powdered sugar to peanut butter mixture and stir to combine with a wooden spoon. 3. Pour into a buttered 8 by 8-inch pan lined with waxed paper. Place a second piece of waxed paper on the surface of the fudge and refrigerate until cool. Cut into 1-inch pieces and store in an airtight container for up to a week. 1. Line 8-inch square pan with foil. 2. Combine chocolate chips, sweetened condensed milk, vanilla and salt in heavy saucepan. Cook over low heat, stirring constantly, until chips are melted and mixture is smooth. Remove from heat. Add peanut butter chips; stir quickly just to distribute chips throughout mixture. Spread evenly in prepared pan. 3. Refrigerate 2 hours or until firm. Remove from pan; peel off foil. Cut into squares. Store tightly covered in refrigerator. NOTE: For best results, do not double this recipe. 1. Line a 8 x 8 x 2-inch baking pan with lightly buttered waxed paper or aluminum foil. Set aside. 2. Melt chocolate chips with condensed milk in the top of a double boiler or in a bowl in the microwave. Stir until smooth. 3. Remove from heat and stir in pecans and grated orange peel. 4. Spread in prepared dish and chill until until firm. 5. Carefully remove fudge from pan using the edges of the foil. Cut into squares. Store covered in refrigerator. Makes about 2 1/2 pounds candy. 1. Depending on melting method~ Place chocolate chips and Sweetened Condensed Milk in a pot or bowl. 2. Mix in broken cracker pieces into the heated and melted mixture. 3. Mix in mini marshmallows. 4. Spread evenly in a greased 9×9 pan/dish. 5. Before cutting, cool in refrigerate for one hour. Keep remaining fudge in frig. 1. In large microwavable bowl, microwave chocolate chips uncovered on High 1 minute. Stir after 30 seconds- until softened. Keep stirring until smooth. If not completely softened, continue microwaving 15 seconds at a time, stirring after each microwave time, until smooth. 2. Stir noodles and peanuts into chocolate until well coated. 3.Drop by teaspoonfuls onto waxed paper. Refrigerate about 1 hour or until firm. Store covered in refrigerator. Check out these super easy microwave PEANUT BUTTER FUDGE recipes! Both are yummy and easy to make with kids! Combine cream cheese and chocolate. Mix until well-blended. Stir in crumbs and preserves. Shape into 1-inch balls and roll in chopped almonds. Chill several hours. 1. Mix cereal, peanuts and raisins in bowl. 2. Melt butter in saucepan over low heat. 3. Pour the melted butter over cereal mixture, using a fork to toss lightly until coated thoroughly. 4. Sprinkle chocolate chips over the mixture and toss again. 1. Line cookie sheet with wax paper. 2. Place white chips and shortening in medium microwave-safe bowl. Microwave at MEDIUM (50%) 30 seconds; stir. If necessary, microwave at MEDIUM an additional 15 seconds at a time, stirring after each heating, until chips are melted and mixture is smooth when stirred. 3. Set aside 2 tablespoons candies for garnish. Stir remaining candies and peanuts into white chip mixture. 4. Drop by rounded teaspoons onto prepared cookie sheet. (Mixture may also be dropped into small paper candy cups.) Garnish with remaining candies. * Cool until set. Store in cool, dry place. About 2 dozen clusters. *If desired, all candies can be stirred in. Start with 1 cup of confectionary sugar, adding in condensed milk slowly. Keep adding the sugar until you have made a simple dough. Add in the peppermint flavoring. Shaping mints: Using a scoop-scoop out a bit of dough, then roll it into a ball. In a saucepan, melt chocolate chips and 3/4 cup condensed milk over low heat, stirring occasionally. Line an 8 inch square baking pan with waxed paper; butter the paper. Spread half of melted chocolate mixture into pan; chill for 5-10 minutes (keep remaining melted chocolate at room temperature. In another saucepan, melt vanilla chips. Stir in remaining condensed milk and mix well. Remove from the heat; add extract and food coloring. Chill. Spread over chilled chocolate layer; spread reserved melted chocolate on top of mint layer. Chill. Cut into 1 inch pieces. 2. Add peanut butter, Rice Krispies, peanuts and marshmallows. 3. Drop by teaspoons on waxed paper. PUPPY CHOW…These are also known as ‘Muddy Buddies’ and ‘Reindeer Chow’ in the Winter…Kids (grown-ups too) love this one! 1. Melt peanut butter, margarine and chocolate chips. 2. Pour mixture over large box Crispix; coat well. 3. In a paper bag put 2 1/2 cups confectioner sugar. Snack mix with chocolate, peanuts, marshmallows and pretzels. Start to Finish: 50 min. 1. Place chocolate chips in freezer to chill. In large bowl, mix cereals, peanuts, pretzels and marshmallows; set aside. 2. In large microwavable bowl, microwave candy coating uncovered on High 1 minute 30 seconds; stir, breaking up large chunks. Microwave about 30 seconds longer or until coating can be stirred smooth. 3. Gently and quickly fold cereal mixture into coating with rubber spatula, stirring gently until evenly coated. In a microwave or heavy saucepan, melt the chocolate and butterscotch chips; stir until smooth. Stir in chow mein noodles and peanuts until well coated. Drop by rounded tablespoonfuls onto a waxed paper-lined baking sheet. Refrigerate for 2 hours or until set. In a large bowl, combine the peanut butter and marshmallow creme; add cereal and stir until well coated. In a microwave, melt chocolate chips and shortening; stir until smooth. Roll cereal mixture into 1-in. balls. Dip in chocolate; allow excess to drip off. Place on a waxed paper-lined pan. Refrigerate until set. Line a 9 x 13 pan with crackers. Combine butter, sugars, crumbs and milk in a saucepan. Bring to a boil, turn heat down and stir constantly for 5 minutes or until it starts to thicken. Spread half of mixture over layer of crackers. Add another layer of crackers. Spread other half of mixture over. Put another layer of crackers over all. Melt chips and peanut butter together. Stir until smooth. Spread over crackers. Refrigerate for 1 hour and mark with a knife through the chocolate. Return to refrigerator for several hours and cut through bars. 1. Crush graham crackers into fine crumbs. 2. Combine crumbs, sugar, and butter. 3. Press mixture into the bottom of a 10″x11″ pan. 4. Stir together coconut and milk. 5. Spread over crumb crust. Bake @ 375 for 15 minutes. 6. Melt chocolate chips, stir in peanut butter and spread over warm baked mixture. Line a 13″ x 1” baking pan with heavy-duty tin foil. Place graham crackers in the pan. (They fit perfectly! 1. In medium saucepan, stir caramels and water over low heat until smooth. 2. Remove from heat and gently stir in nuts, candies and pretzels. NOTE: I made these following the above reciepe; however, I think these chewy delights would be excellant using chopped pecans or peanuts instead of the walnuts. Break pretzels into thirds, add nuts. Melt chocolate according to package directions. Pour chocolate over pretzels and nuts, stirring to cover all. Drop by spoonfuls onto wax paper on cookie sheet. Refrig about 10 minutes. 1. Heat oven to 350 F. Line cookie sheet with parchment paper or foil. 2. Place one pretzel for each pretzel treat desired on prepared sheet. Top each pretzel with one ROLO Chewy Caramel in Milk Chocolate. 1. Heat oven to 200 degrees. In large roasting pan combine popcorn and pretzels, set aside. 2. In 2 quart saucepan combine brown sugar, butter, corn syrup and salt. Cook over medium heat, stirring occasionally, until mixture comes to a full boil (12 to 14 minutes). 3. Continue cooking, stirring occasionally until small amount of mixture dropped in ice forms a soft ball or candy thermometer reaches 238 degrees. 4. Remove from heat, stir in baking soda. 5. Pour over popcorn and pretzels, sprinkle peanuts over caramel mixture. Stir until all popcorn is coated. 6. Bake for 20 minutes, stir. Continue baking for 25 minutes. Remove from oven. 8. Immediately place caramel corn on waxed paper, cool.Break into pieces and store in tightly covered container. 1. Grease a large cookie sheet. Set aside. 2. In a heavy 2 quart saucepan, over medium heat, bring to a boil sugar, corn syrup, salt, and water. Stir until sugar is dissolved. 3. Stir in peanuts. Set candy thermometer in place, and continue cooking. Stir frequently until temperature reaches 300 degrees F (150 degrees C), or until a small amount of mixture dropped into very cold water separates into hard and brittle threads. 4. Remove from heat; immediately stir in butter or margarine and baking soda; pour at once onto cookie sheet. 5. With 2 forks, lift and pull peanut mixture into rectangle about 14×12 inches; cool. Snap candy into pieces. 1. Peel, core and slice apples. 2. Cook uncovered in a heavy 3-quart saucepan over low heat. If apples are dry, add a little water to prevent scorching. Cook until the they have the appearance of applesauce. Continue cooking until apples are brown and look like apple butter. 3. Add sugar if apples aren’t sweet enough and add lemon juice if the apples aren’t tart enough. 4. Add the spices. Mix completely and let cook a little longer to allow the flavors to blend. When the apple mix clings to an upturned spoon, it is ready. 5. Cool in an uncovered pot. 6. Spread mix evenly and thinly on 2 waxed paper lined cookie sheets. Let dry in a warm oven (125 degrees) overnight or on the counter uncovered, for 2-3 days. Check the apple leather for dryness. When you can touch it with your finger and it is not sticky, it is dry enough. It should be flexible, not brittle. 7. Cut in 1/2 inch strips. 8. Wrap in waxed paper or plastic wrap. Eat like a fruit roll. Store in tightly sealed containers; it can also be frozen and will keep well for months. Microwave high-quality chocolate in a bowl. Cookies, dried fruit, citrus peel, granola bars, pretzels, peanuts, caramels, and marshmallows. Fruit such as cherries, strawberries, oranges, kiwi, bananas, orange segmants, sliced or whole apples, raspberries and melons also make wonderful dipped candies. When I melt chocolate for dipping- I add about a teaspoon to teaspoon and half of shortening such as ‘Crisco’ to the chocolate. (The amount of shortening depends on the amount of chocolate being melted.) Do not use liquid shortening. Make sure fruit is rinsed and thoroughly patted dry. When dipping rasberries, do not wash them and thread 3 to 4 on skewers. Slice bananas in long pieces. White chocolate is great to use for a black and white effect. Let the first chocolate harden before dipping or drizzling with the other. To avoid messy hands, try dipping some of them with skewers or toothpicks. Place the chocolate candies on a cookie sheet that has been covered with wax paper and refrigerate or freeze until they harden. 1. Line baking sheet with waxed paper. 2. Microwave morsels and shortening in medium, microwave-safe bowl on MEDIUM-HIGH (70%) power for 1 minute; stir. Microwave at additional 10 to 20-second intervals, stirring until smooth; cool slightly. 3. Dip fruit about halfway into melted baking bars; shake off excess. Place on prepared baking sheet; refrigerate until set. 1. Microwave 1/2 cup NESTLE TOLL HOUSE Premier White or Semi-Sweet Chocolate morsels or baking bars, broken into pieces in small, heavy-duty plastic bag on MEDIUM-HIGH (70%) power for 1 minute. 3. Microwave at additional 10 to 20-second intervals, kneading until smooth. Cut tiny corner from bag; squeeze to drizzle over fruit. Refrigerate until set. Drain cherries; discard juice or use for another purpose. Put cherries on paper towels to dry completely. Put chocolate chips in a medium saucepan with a heavy bottom. Heat over low heat, stirring constantly, until chocolate is melted. (The chocolate can also be melted in the microwave.) Remove from heat. If desired, dip some of the cherries in melted white chocolate chips instead. Start with 1 minute then continue at 30-second intervals, stirring after each, until completely melted. Recipe from Cherry Marketing Institute. Peel bananas and slice them into several pieces. Place 8 oz. chocolate chips in a microwave safe bowl and cook on high until melted for about 1 minute, stirring every 30 seconds until smooth. Push each sucker stick halfway through a large marshmallow; set aside. Melt white morsels according to package directions. Immediately dip 10 marshmallow lollipops lightly in the melted morsels for a thin coating. Set the stick side up on prepared baking sheet. Melt milk chocolate morsels according to package directions. Repeat dipping process as above with remaining marshmallows. Optional: Colored sprinkles/jimmies can either be sprinkled on top of the white chocolate layer or the bottom chocolate layer. 1. Line an 8 x 8 x 1 1/2-inch square pan with aluminum foil, allowing the foil to hang over the edges of the pan. Grease the pan with 1 teaspoon of butter. 2. Place sugar, milk, pumpkin, cornstarch and pumpkin pie spice in a saucepan and cook quickly, stirring them constantly until they boil. 3. Cover and cook 2 to 3 minutes. 6. Add vanilla and beat with mixer until smooth and creamy. 7. Pour into prepared baking pan. When firm, remove fudge from pan, peel away foil and cut into squares. Just put out goodies and allow children to create snow people and sculptures. Insert pretzel sticks into the marshmallows and build from there…Of course put out extras for the kids to munch on as they build! 1. Butter 13 x 9-inch baking pan. 2. Microwave 1 1/3 cups butterscotch morsels, semi-sweet morsels and peanut butter in large, uncovered, microwave-safe bowl on HIGH (100%) power for 1 minute; STIR. The morsels may retain some of their original shape. If necessary, microwave at additional 10- to 15-second intervals, stirring just until morsels are melted. 3. ADD pretzels, peanuts and Raisinets; stir well to coat. Spread into prepared baking pan. 4. REFRIGERATE for 1 hour or until firm. 1. Melt chocolate in microwave. If using semi-sweet or milk chocolate chips-melt it in the microwave and check it each minute. 2. Dip the candy canes half-way into the chocolate. 3. Lay on wax paper to cool. You’ll now have the yummiest stir sticks around! These would also make nice gifts! Check out the “Suggestions for wrapping dipped pretzels” for ideas-page bottom of ‘Wrapping Gifts Category! Also check out Ideas & fun with Candy Cane ideas and all the wonderful Cocoa recipes! Gently brush each marshmallow with corn syrup. Roll in sugar crystals and cake sparkles. Set aside on parchment paper to dry. Cover lightly with saran wrap to keep air off so marshmallows don’t dry out. Once set, enjoy or place into snack-sized zip loc bags for gifts or later! Use wrapped treats and an ordinary stapler. Simply staple the ends of the wrappers together. (For loops and dips, make sure the garlands are at least double the length of the surface from which you will drape them. When the Christmas Holidays are over–buy all the red and green M&M candies you can. Often they are on sale at 50-75% off and you can use the red for Valentine’s Day and save the green for St. Patrick’s Day! Make Rice Krispie Squares according to recipe. Once the Rice Krispies are made, cut them into hearts using a Valentine cookie cutter. Place a popsicle or candy stick into each cut-out rice krispie. Place the Rice Krispies in refrigerator or freezer for five to ten minutes. The coolness of the rice krispies will help the chocolate adhere quickly and easily to the treats. Directions: Preheat oven to 170 degrees. Place pretzels on a parchment or waxed paper-lined cookie sheets in a single layer. DO ONLY ONE TYPE OF CANDY PER SHEET because the Hugs melt faster than the kisses. Unwrap Hugs or Kisses, place one on each pretzel, repeat for an entire cookie sheet. Place cookie sheets in the preheated oven, bake 4 MINUTES FOR THE SHEET OF pretzels and HUGS—-5-6 minutes for the pretzels and KISSES. 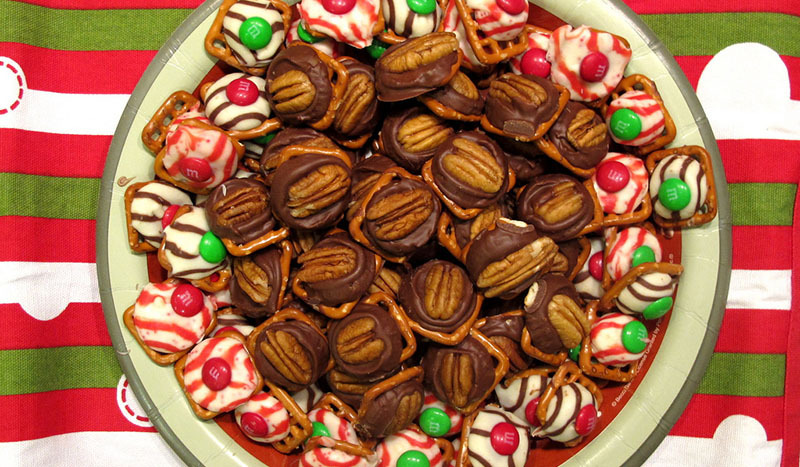 Remove from oven and immediately put a M&M on top of each pretzel/chocolate, pressing down gently. When pressing down you may need to wiggle the chocolate around a little to fill in any gaps between the chocolate and the pretzel. This will help the chocolate stick to the pretzel. kid activities is a participant in the Amazon Services LLC Associates Program, an affiliate advertising program designed to provide a means for sites to earn advertising fees by advertising and linking to amazon.com.